As part of my Professional Specification module I’m required to make contacts with at least 3 people in the field I wish to specialise. Not that I should need to be told to do this as it’s a great way for me to get a handle on the level of expertise required in the industry, get constructive feedback on my work, make contacts within the games industry, etc., but I digress. 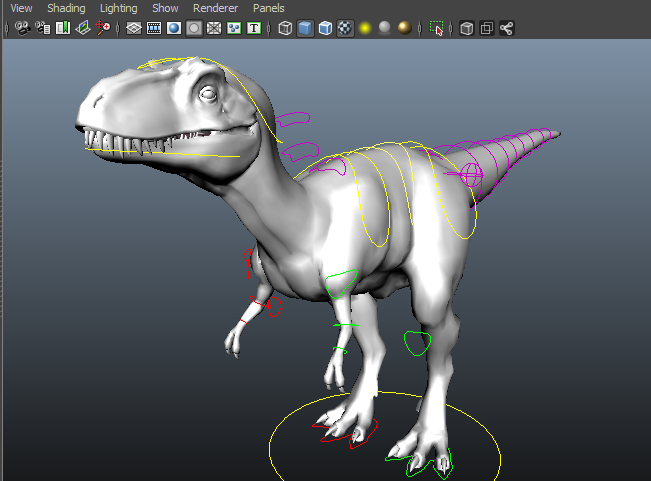 I’ve been looking up UK based technical animators within larger UK games studios (specialised technical animators are a rare thing in small studios it seems,) and found Harry Gladwin-Geoghagen’s awesome dino-rig. Since I’ll be animating and rigging a small bird this semester there’s something to draw from here as much of the joint layout and IKs will be similar, never mind that having an example rig from a professional is a great source of research and inspiration for my own work. The full rig, along with Harry Gladwin-Geoghagen’s “Harryrig” is available to download here: http://www.harry-gg.co.uk/downloads.html. Previous Previous post: My old mech!